Now that you’ve seen how to do fetches, merges, and pulls from a remote tracking branch within Visual Studio, let’s rinse and repeat from the command line. Personally, it’s been easier to first grasp these concepts using Visual Studio, then rinse and repeat at the command line level. Note how the local branch `for-review` is listed first (which kinda gets blended in color-wise with the command), then master, then the remote tracking branches. Something that has confused me for a long time until I wrote yesterday’s post was whether “remotes/origin/why-not” was the same as “origin/why-not” or even the made-up “remotes/why-not” (which I don’t think a branch is ever referred to as such). Now that I can visualize what both the command line and Visual Studio are doing, it’s easier to get my head wrapped around these remote tracking branches. 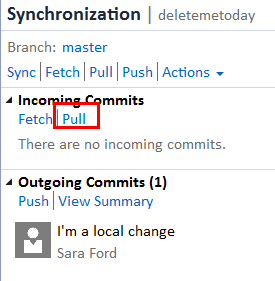 Suppose this time you have conflicts when you do a Pull, meaning your local branch had a conflicting change that was committed locally (but not yet pushed – see Outgoing Commits 1 in screenshot below) and someone else (let’s say you via GitHub.com UI) made a corresponding conflicting change on the remote. Here’s the UI setup in Team Explorer. Click on Pull. Git halts the pull operation (at the merge portion) when it detects the conflicting changes, as expected. From here it should be familiar territory by now. 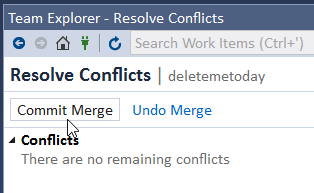 Clicking conflicts brings you to a merge conflict screen. 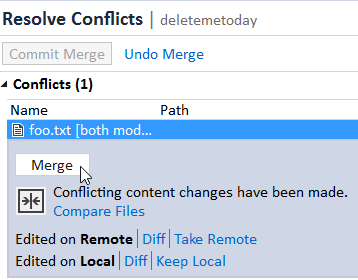 Clicking Merge brings up the 3 way merge tool (or choose a take remote or a keep local). If you go the Merge tool route, make sure you click “Accept Merge” at the top. Gets me every time. 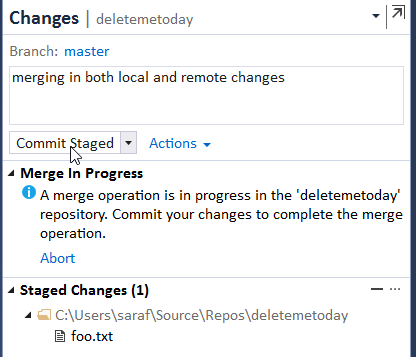 Once you’ve accepted the merge (or choose to use the remote or local version), click Commit Merge. Now we have to commit those our resulting merge. Click Commit Staged in Changes pane in Team Explorer. and you’re done! 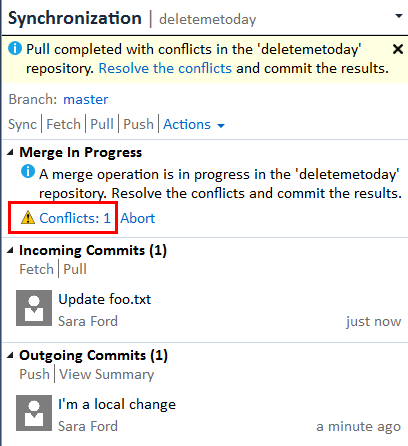 Reviewing the local master history shows the merge commit now as the tip. Still thinking re yesterday how a Pull is different than a Fetch + Merge. I guess if you know you want to download changes, but not ready to deal with any potential conflicts at this time (e.g. going offline for a while or got other things to do right now), Fetch is the way to go. If you know you’re ready to start playing with the code on your local branch, then Pull is the way to go, I think. 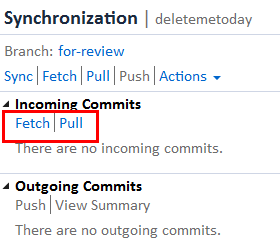 Today’s tip shows how to combine doing a Fetch and a Merge by using the Pull command. Suppose you have some incoming commits that you’re ready to merge into your local branch. In this example, I’ve create a new file on master on GitHub and I want to bring that commit into my local master branch. Instead of fetching to review the commits that are going to be applied, we’ll assume you’ve already looked at GitHub to see what will be merged in. The result of the Pull command shows a message at the top of the Team Explorer. Viewing the history on the master branch shows the tip (the top of the branch) having the newly merged in commit from GitHub. if you want to know if you’ll run into any merge conflicts before doing the Pull (the merge portion of Pull). However, I’m not sure how you can know if you’re going to have any merge conflicts, if you haven’t first merged the commits somewhere. I guess you could manually review the changes. Perhaps someone reading this knows what I’m missing. In yesterday’s example, you saw how to create a local branch from a remote tracking branch. In today’s tip, you’ll download new changes from the server into your local branch. Suppose you know there are changes on a GitHub repo (in today’s example) you want to download to your computer. First, switch to the branch you want to pull down, e.g. `for-review` is the branch with the changes I want. 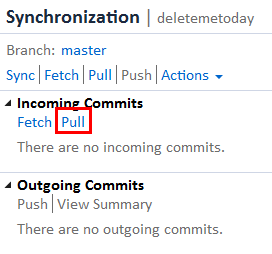 You can go to Team Explorer – Sync pane and click Fetch under Incoming Commits (or at the top of the pane). Now suppose you are ready to do something with these “incoming commits”, i.e. get the into your local branch `for-review`. 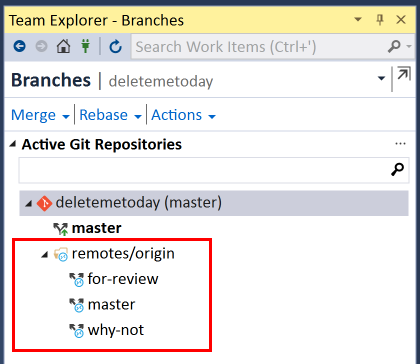 Remember, your local branch is a just branch of the remote tracking branch, so you need to merge these 2 commits from the remote tracking branch into your local branch. The only thing that should look differently is the from branch name “origin/for-review”. Click Merge to merge in the two incoming commits from the remote branch. Go to View history to see the resulting timeline. 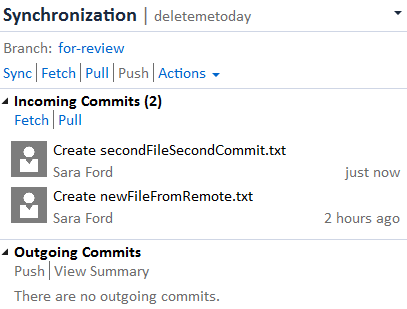 Sync will show 0 incoming commits now that they have been merged. Suppose you’ve cloned a project from a GitHub repo that contains multiple branches. By default, Git pulls down the main tracking branch (e.g. master in most cases). That’s why you see a local checked-out (bolded) master and a remotes/origin master branch. 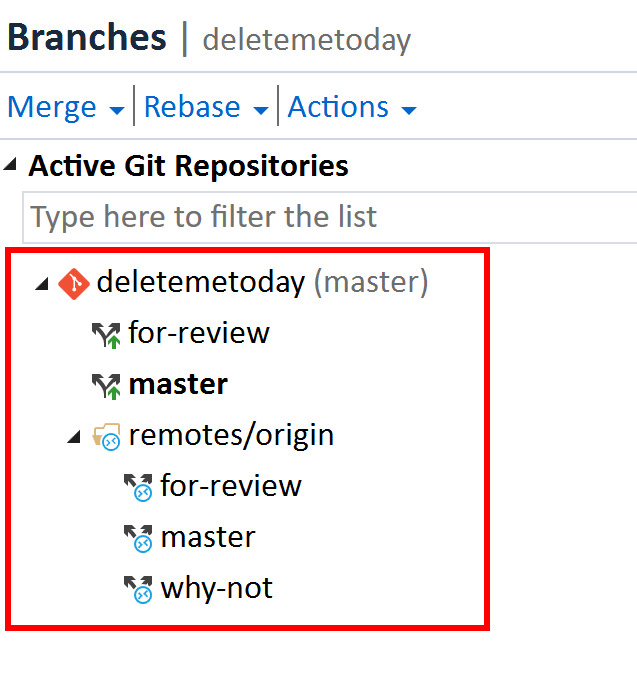 For the other branches under remotes/origin, Git doesn’t automatically pull these down. The branches listed under remotes/origin are called “remote tracking branches”. I believe these are also referred to as “remote branches” but the “tracking” is implied. Can you have a remote branch that isn’t a remote tracking branch? I guess not. I guess even if you checked out a “remote tracking branch” without the tracking flag (or without the checkbox checked), you’d still have the original “remote tracking branch” alongside the local non-tracked branch. You cannot check out these remote branches directly. I guess if you could, you’d be working directly on the server instead of your local machine, which wouldn’t make too much sense, and probably wouldn’t be possible since a bare git repo (aka the git server you’re checking out from) doesn’t have a concept of a working directory. No idea. Just thinking out loud here. Suppose you want to checkout the `for-review` branch to do work. First you’d need to create a new branch. Note just like 13* we’re going the long way around, meaning we’re not going to choose the “checkout” command in the context menu. We’re going to manually create the local branch first, then checkout, to see the process. First, right click on the remote branch, and select New Local Branch From on the context menu, just as if you were creating any other branch. The Create Branch window section will appear. 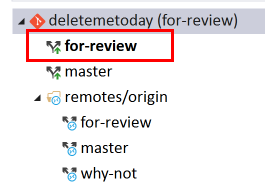 Note how Visual Studio auto-populates the name of the local branch as `for-review` You could change the local branch name. You could also do `private string @long`. I’m sure the `@long` is far worse. Checking the Create Branch button creates the local `for review` branch. Because the default is the Checkout branch option checked, the `for-review` is bolded. I believe the Checkout command on the context menu for a remote branch will perform the above steps, but I’m not sure if there are any differences. For example, I’d assume the checkout command keeps the defaults (e.g. Track remote branch and Checkout branch – of course). In any case, when I’m trying to learn something new, it is helpful for me to see what is going on step-by-step as much as possible. If I have any of the above terminology wrong, please let me know!! *Heaven Sent was one of the best Doctor Who episodes in a LONG time. Wow, just wow.